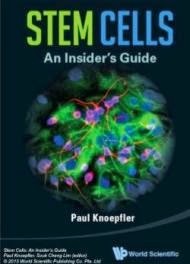 Adult stem cells and cancer cells have many things in common, including their ability to migrate through tiny gaps in tissue. They also experience a trade-off when it comes to this ability; having a flexible nucleus makes migration easier but is worse at protecting the nucleus’ DNA compared to a stiffer nucleus. Nuclear proteins that regulate nuclear stiffness are therefore thought to control processes as diverse as tissue repair and tumor growth. Now a new study by researchers at the University of Pennsylvania has shown that cell migration through micron-size pores is regulated by lamin-A, a nuclear protein that is very similar to the fibrous ones that make up hair. They have also shown that a cell’s ability to survive the mechanical stress of migration depends on proteins called “heat shock factors.” Using an anti-cancer drug that inhibits heat shock responses, they showed that this drug’s effectiveness relies on inhibiting the invasive migration of cells via the same mechanism. Taking into account the role that lamin-A plays in increasing nuclear stiffness could help stem cell biologists and cancer clinicians interpret the diversity of nuclear shapes seen in a static sample of tissue under a microscope. 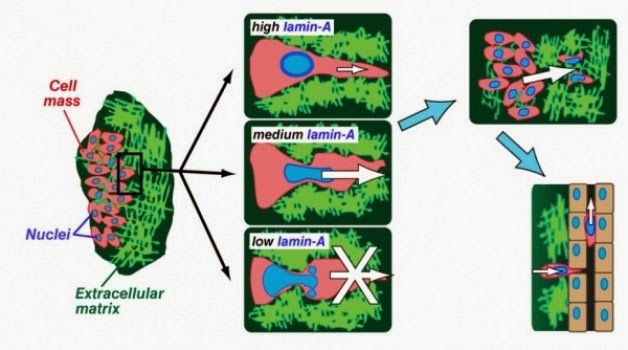 Nuclei normally appear rounded but can also appear multi-lobed or greatly elongated; high lamin-A levels tend to produce the more distorted shapes after a cell squeezes its nucleus through a narrow pore. "If we can understand more clearly the effects the lamin-A meshwork within nuclei has on the ability of cells to crawl through tiny openings. then we can develop better nucleus-directed treatments for stopping the spread of cancer or for keeping stem cells in the right place while they grow into tissue." said Dennis Discher, professor in the Department of Chemical and Biomolecular Engineering in the School of Engineering and Applied Science. 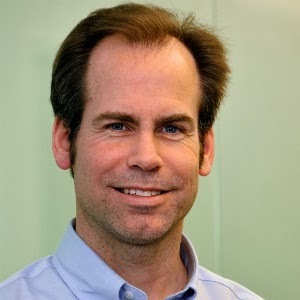 Discher, along with lead author Takamasa Harada, a graduate student in his lab, conducted the studies with fellow lab members Joe Swift, Jerome Irianto, Jae-Won Shin, Kyle Spinler, Avathamsa Athirasala, Dave Dingal and Irena Ivanovska, as well as undergraduate student Rocky Diegmiller. The study’s experiments were conducted on immortalized human cancer cells as well as human-donor-derived mesenchymal stem cells, which are in wide use in clinical trials for tissue repair. The researchers either inhibited or overexpressed lamin-A in the cells, then placed both kinds on top of a thin sheet with very small pores. By adding blood serum to a chamber on the bottom of the porous sheet, the researchers encouraged the cells to push, pull and squeeze their nuclei through the pores. To migrate to other parts of the body, a cell's nucleus must squeeze through pores — and survive the trip. Looking under a microscope at the cells that made it though the sheet revealed very few of the cells where lamin-A had been overexpressed. There was also a dearth of cells where lamin-A was strongly repressed. The cells that were most successful in migrating through the sheet’s pores were the ones with lamin-A only slightly less than normal. "The decreased migration with very low lamin-A levels was especially surprising. and so we measured the physical stiffness of the various nuclei, confirming that cell nuclei were systematically softer with low levels of lamin-A. While cells with stiffer nuclei are clearly unable to push or pull their nuclei through the pores. all of the softer nuclei could be moved through more easily, which presented a paradox." said Harada. To resolve the paradoxical decrease in cell number with very soft nuclei, the researchers saw that the cells on the bottom of the porous sheet turned on a marker for cell death that was otherwise absent from cells on top and the lower the lamin-A the greater the number of dying cells. As a cell squeezes its nucleus through a small pore, cell death is triggered and more so when lamin-A is low. "Moderate decreases in lamin-A allow more cells to migrate and live. but, when lamin-A is too low, death dominates migration. The narrow pore becomes a torture chamber for the DNA. We were bewildered by this and analyzed hundreds of proteins for some clue, discovering that another stress response pathway is deficient when lamin-A is very low. The heat shock proteins are famous for being turned on by high temperature stress to protect DNA and the rest of the cell, and the underlying gene circuitry somehow turns off when lamin-A is made artificially low." Discher said. The researchers showed that treating cells that have normal levels of lamin-A with a drug that inhibits heat shock proteins had the same effect as reducing lamin-A levels. The findings provide a better fundamental understanding of the roles of nuclear stiffness and stress resistance and could underpin other treatments as well. "There really were no previous studies showing that the nucleus in stem cells and cancer cells could have such a prominent role in cell trafficking. And, since we confirmed some of our cell culture observations by studying human tumor growth in mice, this very physical mechanism must apply to human tissue as well. Nuclear stiffness is a property that should also help keep stem cells anchored in their niche until tissue is damaged to release the cells." Discher said.